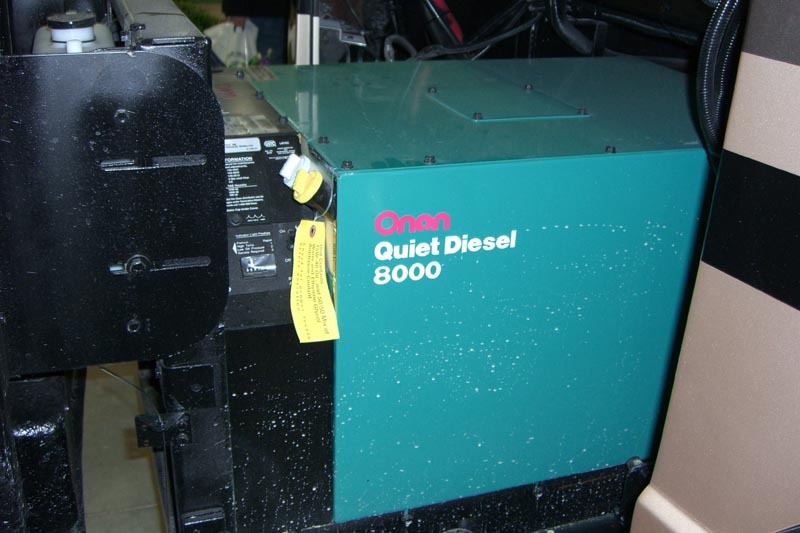 There are great options for anyone who wants to invest in a Class A motor home. The most recognizable names in the Class A motor home industry though are probably Airstream and Winnebago. Airstream has been manufacturing quality motor homes and travel trailers for over 70 years. Their most recognizable product is their “silver bullet” travel trailer, but they are also well known for their luxurious Class A motor coaches. Winnebago is another icon in the motor home business, has been manufacturing motor homes since the 1950’s. They not only manufacturer Class A motor homes, but Class B and Class C motorhomes as well. What exactly is a Class A motorhome? There are the motorhomes that look like buses (some of the newer ones have semi truck styling on the front end but are still super luxurious). If you walk into a RV lot and you want to be able to pick out which RV’s are the Class A ones, just look for the ones that look like super fancy touring buses with fantastic looking paint jobs. Class A motor homes are generally the most desirable because they are the largest and most luxurious. When you step into a Class A motor home or luxury coach, as some of them are called, you’ll feel like you are stepping into a small luxurious home. Even the driver and passenger seats are luxurious, often high end leather captain’s chairs that are very comfortable and that swivel to face the living area of the motor home for use while the motor home is parked at its destination. There’s no doubt that a Class A motor home is an investment to not take lightly, but if you talk to almost anyone current owner of one they will tell you how much they love having one. It’s a great way to travel. When you reach your destination, there’s no dragging your luggage into a hotel and trying to sleep in an unfamiliar bed in an unfamiliar room. You don’t even have to worry about finding a restaurant to eat at. You just check into the RV park or campground; park your RV; put down the stabilizers; hook up to the water and electric; and you’re all set. Everything you need is already inside your motor home because Class A motorhomes have nice bedrooms with a queen or king size bed; a bathroom with shower; a full size kitchen; plus a living room/entertainment area that may rival what you have at your regular home. Rear hitch for towing an automobile, motorcycle, or maybe some fun toys like a couple of ATV’s. Automatic step covers that cover the entry steps so you don’t have to worry about accidentally stepping down into stairwell area and spraining your ankle. High end entertainment centers featuring flat screen and plasma TV’s. Bathrooms with a shower and a full size garden style bathtub. You might think that the inside of a Class A Motor home is going to feel cramped and narrow because of width constraints. But the slide-outs that are so popular make the living space much more spacious. 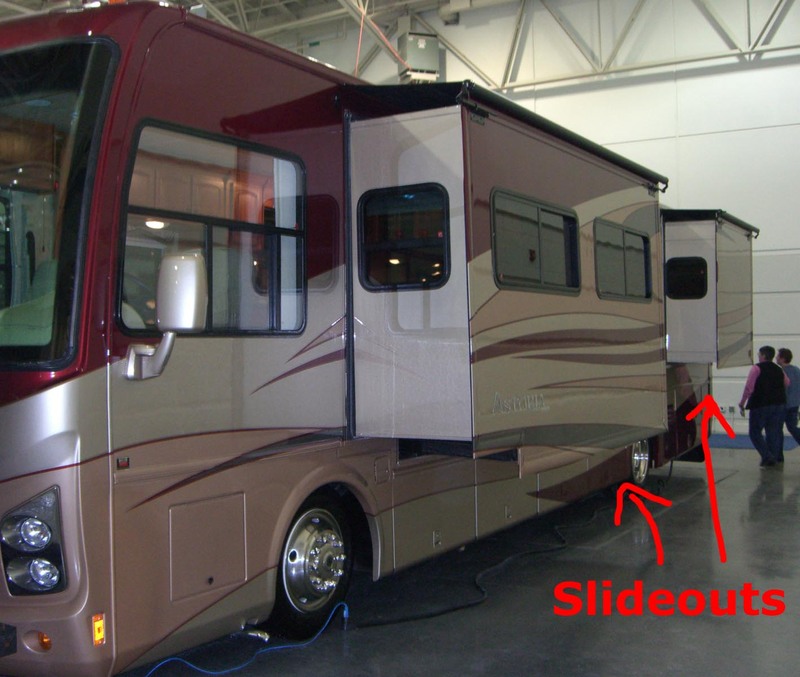 A slide-out is an area on the motor home where the wall can be pushed outwards several feet which results in instant exterior square footage. Moving the slide-outs in or out is done with the push of a button. But what type of frame are they built on and what about their engines? If you’re a guy I know you’re wondering about this. 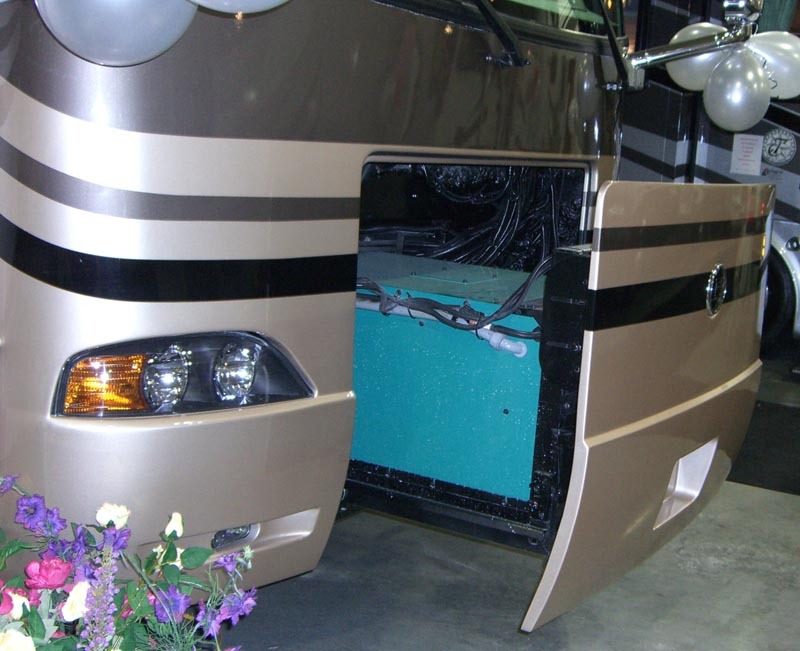 Although frame construction varies somewhat among the various manufacturers, the frame is often built with a combination of steel for durability and aluminum to help keep the overall weight of the motorhome down a little bit to help with gas mileage. The chassis in the Class A motor homes is specially designed and made for durability. For example, Mandalay Coach uses a Freightliner XC chassis in their Mandalay Class A motor home and a 400 Cummins ISL diesel engine with two-state compression brake. The Airstream Land Yacht Motorcoach has a Freightliner XCR 400 horsepower Caterpillar engine. And the Airstream uses has an aerodynamic construction process that helps improve gas mileage. The newest diesel Class A motor homes I’ve seen have a front end that is similar in shape to the front end of a semi-truck, versus a traditionally styled Class A motorhome that has the same front end styling a bus. The resemblance to a semi ends with the front end styling. These newer style Class A motor homes are sleek and gorgeous. At the latest camper show I was at, the Grand Sport by the Dynamax Corporation stole the show. Everyone wanted to look at it. 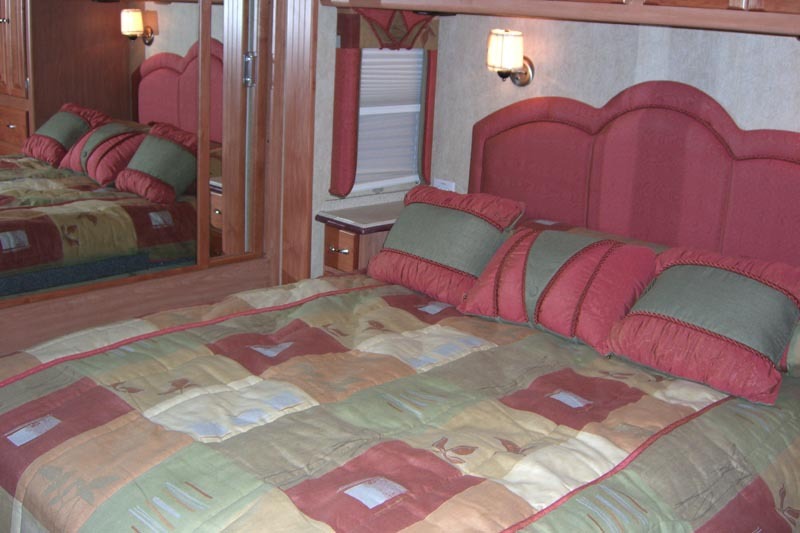 It’s a Class A motor home that has a streamlined truck design and a luxury motorcoach interior. Although specifications for any feature vary somewhat with the model and manufacturer, towing hitches are typically standard on Class A motor homes. Towing capacities typically allow for towing of an automobile or small SUV to use for taking short trips once the RV is parked at its destination since the large size of the Class A motor home can make it challenge to drive in city traffic and hard to find a parking space for. But, if you are going to tow something with your Class A motor home you will typically need to purchase a special braking system. The available length of Class A motor homes ranges from around 26 feet to about 45 feet, although the most popular lengths are 35-40 feet. While extremely comfortable and luxurious, they are also an investment. Expect a brand new low end model to cost you close to $100,000 after you pay sales tax and any other applicable fees. Generally, the mid-range cost for a Class A motorhome is $250,000-$300,000 although extensive customization such as that done for touring buses can drive the price well over $1 million dollars. What’s the market trend? It’s definitely heading towards the more luxurious models. The affluent population is growing and they are looking for high end items. Class A motor homes can offer everything they’re looking for in a luxurious motor coach. Operating a Class A Motorhome will never will you an award for saving natural resources. They’re gas hogs. That’s why they have big gas tanks, typically around 100 gallons but often as big as 150 gallons. Many things will affect your gas mileage: the size and weight of the motor home you choose; the aerodynamics; whether or not you’re towing an extra vehicle or equipment; what type of driving you’re doing such as driving up and through the mountains, in stop and go traffic in the city, or mostly on a freeway; your tire pressure; and the engine itself. For the most part, you don’t need a special addendum to your driver’s license to drive a Class A motor home. Some states do you require you pass a special test if you are going to operate one of the larger models of Class A motor homes though. Just because you don’t need a special license doesn’t mean driving a Class A motorhome is just like driving a car. It’s more like driving a bus because it’s the size of a bus. Many dealers offer some driving instruction to help you get used to maneuvering your new motor home and some community colleges offer classes to help you feel more comfortable with it before you take it on a cross country trip. Can I Use My Class A Motorhome in the Winter? People don’t like to let a little thing like cold weather keep them away from spending time outdoors and enjoying the scenery. Some of the most beautiful nature pictures I’ve seen are taken in wintertime. Typically, Class A motorhomes don’t come winterized in their standard versions. If you plan on using your motorhome during cold weather make sure the windows are double glazed, everything is well insulated, the tanks are insulated and heated, and that you have a high BTU furnace. Many manufacturers offer a special cold weather package that gives you everything you need to stay toasty and warm in your RV no matter how chilly and cold it is outside. So what is the biggest advantage and disadvantage to owning a Class A Motorhome? It’s the size. It is great having self-contained unit to travel with that has everything you need. On the other hand, the size of the motorhome can make something as simple as finding a parking spot impossible. You’ll also spend quite a bit on gas. If you plan on spending any amount of time at one destination (two or more days) and want to do a lot of driving around in the area, it’s almost imperative that you tow along a vehicle for those short trips especially if you are visiting a tourist area where parking for automobiles if often in short supply. Another option is to rent a car once you reach your destination. The advantage I most often have people mention to me when I ask why they like their Class A motorhome is the “comfort of home” it gives them. When they reach their destination they can open their cupboards and refrigerator and eat the foods they want but also have the option of going out if they choose. They love being able to sleep in the same bed every night with their own linens. It really is like having a “home away from home” because a Class A motorhome really is a small mobile home that is super comfortable. The biggest thing that keeps people away from owning a Class A motorhome is the price, though which is why it’s typically not the first camper or RV people purchase. People typically purchase either a towable camper, Class C, or Class B motorhome before moving up to a Class A motorhome. There are some great options in all those categories. Although Class B and Class C motorhomes aren’t as large as Class A motorhomes, they are still very nice.